Concerted efforts of the government along with new policy initiatives, are well directed to enhance domestic hydrocarbon production and cut down import dependency by 10% in India. Sanjay Kumar and Subrat Sahu explain. India is a petroleum resources deficit country and it heavily relies on import of crude oil, natural gas, and liquefied petroleum gas to meet domestic demand. At the end of 2015, India had only 0.3% and 0.8% of global proven crude oil and natural gas reserves, respectively. On the contrary, India is the third largest crude oil consumer with 4.5% of global share behind China (12%), and the US (19.7%). In terms of refining quantity, India is placed in the fourth position with 4561 thousand bbl/d which is about 5.7% of global share. India contributes approximately 1.5% of the total global natural gas consumption of 3135 MT of oil equivalent. The country’s primary energy consumption basket statistics suggests that fossil fuels dominate consumption with coal contributing the lion’s share (58%) followed by oil (27.9%) and natural gas (6.5%). Other cleaner fuels like hydro (4%), renewables (2.2%), and nuclear (1.2%) put together contribute about 7.4%. India’s growing economy demands higher consumption of crude oil and natural gas, resulting in rising import of fossil fuels. 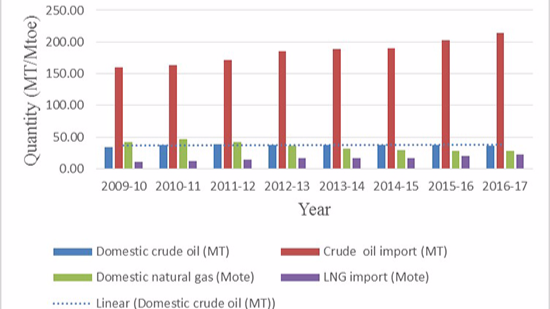 Since 2009-10, import of crude oil has been on the rise due to surge in demand and stagnant domestic crude oil production (Fig.1). Crude oil import more than doubled to reach 213.93 MT in 2016-17 from 111.5 MT in 2006-07. Moreover, falling domestic natural gas production also pushed higher import of liquefied natural gas (LNG).